Know answers of 4 major trade questions – Who is Importing/Exporting? What is the Quantity & Price? When Shipment Took Place? From Which Port or Country Shipment Took Place? Track each & every shipment which comes in or goes out from Sri Lanka for making best business decisions to stay ahead in the market. 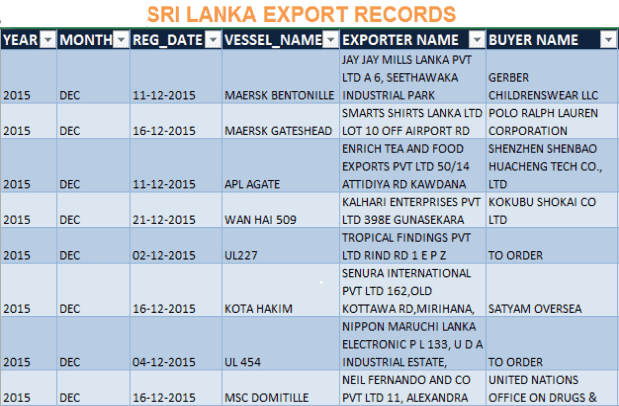 Find new and potential buyers and sellers for your products from our latest Shipping Records of Sri Lanka. Build long-lasting business relationships with the most trusted importers or exporters of Sri Lanka and compete in the market with workable business strategies. Business intelligence trade reports include - in-depth analysis of Market and Demand & Supply of Products. See import export activities of Sri Lanka from the third eye of our industry specialists, financial experts and data scientists and study all business aspects of Sri Lanka trade. Sri Lanka recorded a trade deficit of USD 8527501000 in 2015. The trade statistics recorded in 2014 were - USD 19244461000 (Imports) and USD 11295486000 (Exports) and in 2015 were - USD 18967231000 (Imports) and USD 10439730000 (Exports). Sri Lanka's two largest import partners in 2015 were India & China with 22.5% & 19.7% share in value respectively. And two largest export partners in 2015 were United States of America & United Kingdom with 26.8% & 9.8% share in value respectively. The Country is one of the largest producers of rubber, coconuts, milk & eggs. Other agricultural products are Rice, Oilseed, Grains, & Spices. Its major industries include - Textiles, Information technology Services, Construction, Insurance & Banking. Data accuracy is our main factor of your satisfaction. 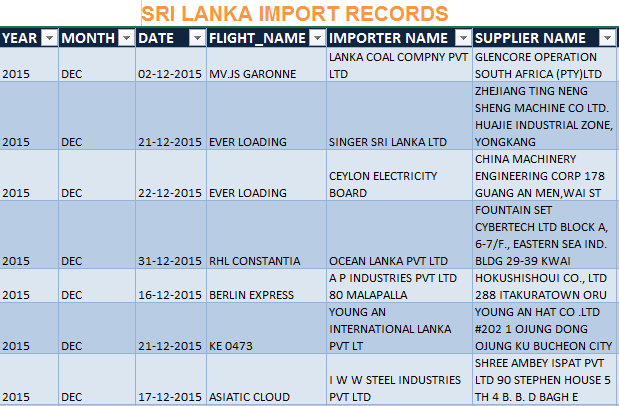 So, before buying customs data of Sri Lanka, see the sample of imports and exports below. And understand that in which format, we provide import export data of Sri Lanka. Download sample of shipping records in a single click. www.SriLankaImporter.com is the most trusted and best source of exploring customs import export data of Sri Lanka for meeting business requirements. We assure our clients that we always provide authentic trade data along with complete shipment details that is collected from our genuine sources. Through our largest database, we are able to serve our customers with major trade information including list of importers & exporters, product details, value of shipment and so on. Hence, we cover all major data fields in our shipment records of Sri Lanka. We are always committed to help our clients with unmatched insight into their industries by providing import export shipment data of Sri Lanka on a near real time basis through a user-friendly and structured interface. We serve as a very powerful resource for finding new potential markets, competition analysis, analysing pricing and buying trends for your products through Sri Lanka trade data compiled from bills of entry and shipping bills. Hence, we are the most trusted destination for accessing every piece of valuable trade data of Sri Lanka that is based on custom details and can be benefited to import export business in several ways from tracking competitor's shipment to finding new customers. As we are associated with Export Genius, so we are an experienced market research company and dedicated to get in-depth trade information of Sri Lanka. We give you following reasons that will make you understand how we differ in the industry. We offer Sri Lanka trade data at highly competitive price along with attractive packages. So, we are an affordable source for every type of business to get customs data of Sri Lanka. We offer many fields in Sri Lanka trade data i.e. HS Code, Importer Name, Exporter Name, Value of Goods, Vessel/Flight Name, Quantity, Gross Weight, Unit, Transport Method etc. Our database is updated on monthly basis. So, we are able to deliver you customs data of Sri Lanka and meet your business requirements at the earliest possible time. Our analytical business intelligence reports provide you larger picture of Sri Lanka trade. So, we help you to gain unmatched insight into your industry.